Continuity mistake: When Pancho jumps out of the train on his horse, you can see that the horse is going to land on the ground with his 2 front legs hitting first. The camera angle changes and the horse lands on all 4 legs. Continuity mistake: When Pancho and Frank are bathing in the lake, you see an Italian Horn on Frank's necklace. The camera angle changes and it is now a medallion. 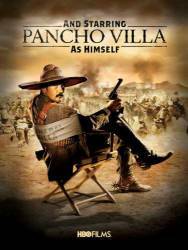 Continuity mistake: When they are showing the movie in New York, there is a scene of all Pancho's army on the train as it is moving. The scene was right before the train track was blown up so there was never a chance for them to shoot that scene. Everyone was on the train. Continuity mistake: When the studio head is holding his press conference to tell everyone that they are making the movie, he starts talking and you see him put his hands behind his back and clasp them together. The camera angle changes and his hands are now in front of him. Continuity mistake: When they are showing the movie in New York, the ending showing Pancho making his speech is not the same ending they originally shot. His hands are in a different position. Continuity mistake: When Pancho is shooting his scene as President, he makes his speech and ends it with his hands in front of him. The camera angle changes and his arms are now outstretched in front of him. Sam Drebben: Another day, another dollar.